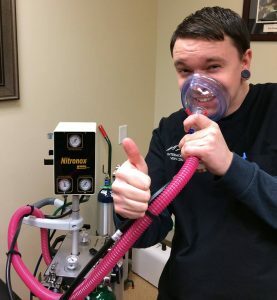 Nitrous Oxide is a colorless, odorless gas that you can mix with Oxygen and breathe in to help with relaxation during an in office procedure. Nitrous oxide (N2O) on its own can only be used safely for very short lengths of time because the lack of Oxygen can lead to unconsciousness and even death. It is safe to use when it is mixed with oxygen. The length of administration and concentration of nitrous oxide and oxygen can deliver four different levels of sedation. You may feel a tingling sensation in your arms and legs or a feeling of vibration. You may feel a sensation of warmth throughout your body. You may experience a feeling of euphoria, floating or well-being. Sleepiness and difficulty keeping your eyes open and speaking are noted (this is over sedation). It is normal to experience symptoms from any of the first three levels when you are properly sedated. If you experience any unpleasant symptoms let the staff know or simply remove the mask. The mechanism of action for nitrous oxide is still unknown. It is known that nitrous oxide depresses almost all forms of sensation such as touch, pain and hearing. It can also disinhibit the emotional centers of the brain. Memory, concentration and performing intelligent acts are minimally affected with nitrous oxide. Nitrous is administered through many different types of mask that cover the mouth and nose. It can be given in different concentrations ranging from 50% nitrous oxide and 50% oxygen to 30% nitrous oxide and 70% oxygen. In our office we administer the 50% nitrous oxide and 50% oxygen mixture. Every office is different and you may experience a different response with each time it is used. Nitrous oxide can be given continuously through the mask or it can be given by demand only when you breathe in. The nitrous oxide mixture needs to be recaptured into a vacuum machine and ventilated to the outside. Nitrous oxide works very quickly reaching the brain with-in 20 seconds if inhalation and causing the relaxation and pain killing properties in 2-3 minutes. There is no hangover effect after the administration of nitrous oxide, the gas is eliminated from your body 3-5 minutes after the gas supply is removed. Nitrous oxide is contraindicated in patients with Multiple Sclerosis, Emphysema and during the first trimester of pregnancy. Nitrous oxide has been used in Dentistry since 1863 and has been proven safe for many years.